Last week, the Norwegian Polar Institute updated their online data collected for the Svalbard area to include 2017 and 2018 — fall sea ice data and spring polar bear data. Older data for comparison go back to 1993 for polar bears and 1979 for sea ice, showing little to no impact of the reduced ice present since 2016 in late spring through fall. See Aars et al. 2017 for details on the 2015 Svalbard polar bear population count, keeping in mind that the subpopulation region is called “Barents Sea” for a reason: only a few hundred individuals currently stick close to Svalbard year round while most Barents Sea bears inhabit the pack ice around Franz Josef Land to the east (Aars et al. 2009; Crockford 2017, 2018). 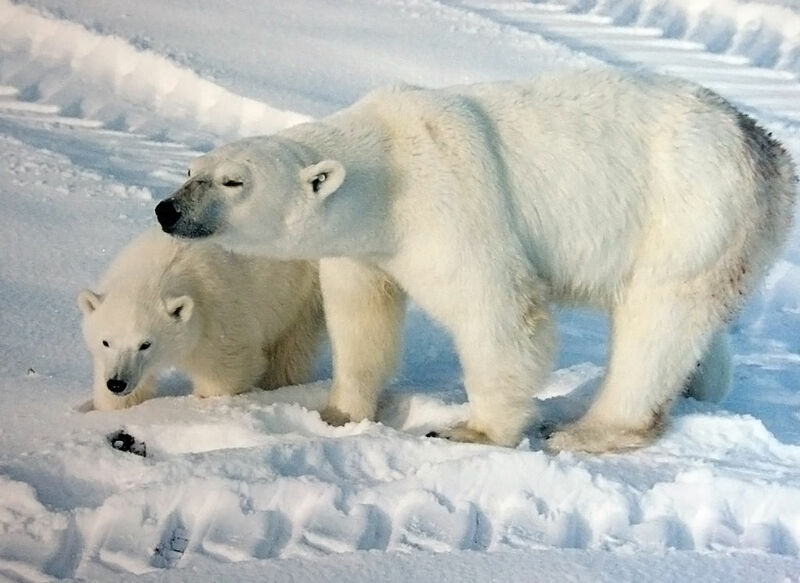 Finally, an unbiased first-hand report about Churchill polar bears and freeze-up on Hudson Bay. Over the last few weeks, biologists Andrew Derocher and Steve Amstrup have been repeating their tired old tales of doom and gloom about the polar bears around Churchill and I’ve done my best to refute the worst of their nonsense. To that effort we can now add this report from PolarBearAlley, where Kelsey Eliasson has posted a good-news story about the bears of Cape Churchill and the progress of freeze-up, including sightings of a number of mothers with cubs. Thick spring ice along the shore of the Eastern and Southern Beaufort is bad news for polar bears, especially females emerging from their dens with new cubs. Are those conditions developing now? 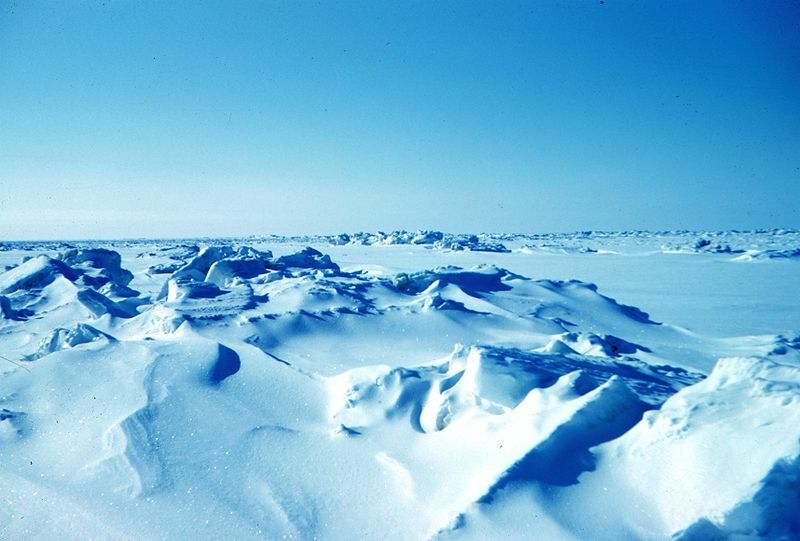 Every 10 years or so, since at least the 1960s, nearshore ice gets too thick for ringed seals to maintain their breathing holes and many breeding seals depart the area. This leaves a lot of polar bears without the baby seals they need to consume to get them through the rest of the year (that’s if they don’t (or can’t) leave themselves). I’ve discussed various aspects of this phenomenon before, with references – see the list at the end of this post. Sadly, we are on schedule for such conditions to recur – could be this year, could be next. The last time of heavy spring ice was 2004 and previous heavy ice conditions occurred the springs of 1964, 1974 (the worst), 1984, 1992 and 2004. The 2004-2006 event was reportedly almost as bad as the 1974-1976 event. So, prompted by reports of the heaviest sea ice conditions on the East Coast “in decades” and news that ice on the Great Lakes is, for mid-April, the worst it’s been since records began, I took a close look at ice thickness charts for the Arctic. I’m not suggesting these conditions are necessarily related to Beaufort ice, just that they got me thinking. Figure 1. Arctic Sea Ice Thickness (NRL), for April 18, 2014. 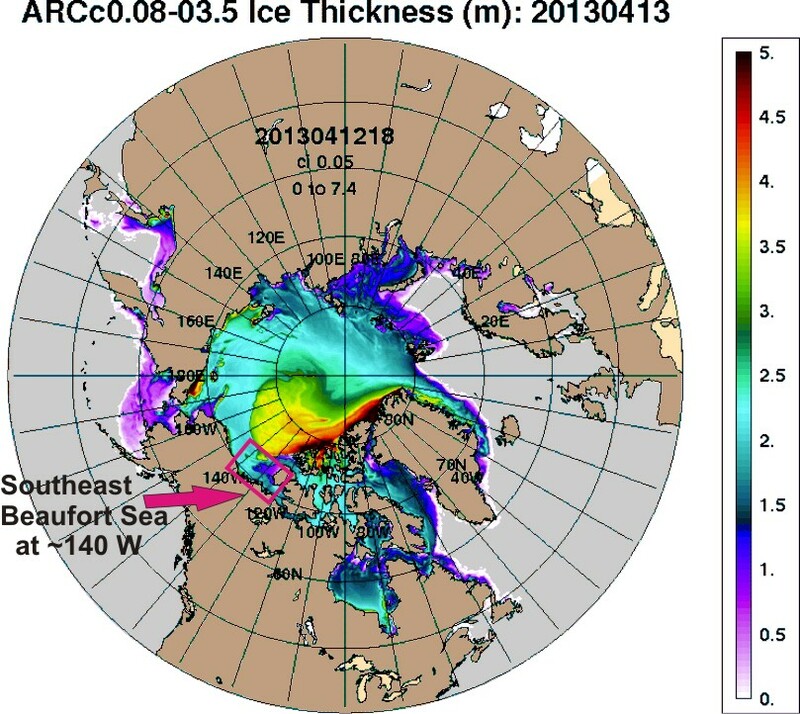 Look at thick ice (yellow, 3.5-4.0 meters thick) spreading along the north coast of Alaska. See the 30 day animation here. Below is a similar image from about the same time last year, with the Southeast Beaufort Sea marked. Figure 2. Arctic Sea Ice Thickness (NRL), for April 13, 2013. Southeastern Beaufort marked. I don’t think this bodes well for Beaufort bears but we’ll have to wait and see if there are any reports of starving bears bit later this spring and summer. Sea ice charts aren’t a guarantee that this heavy spring ice phenomenon is developing in the Beaufort, but they could be a warning.